Preparing for the 2017/18 Undiscovered Voices Competition (yes, I’m giving it another go), I decided to move my work in a new direction and decided that silhouettes were a good way of rendering quite scary scenes in a ‘safer’ way. Yes, I said ‘safer’ – one of the criticisms of some of my work – in particular the witch for the last UV comp – was that it could be too grim and scary. 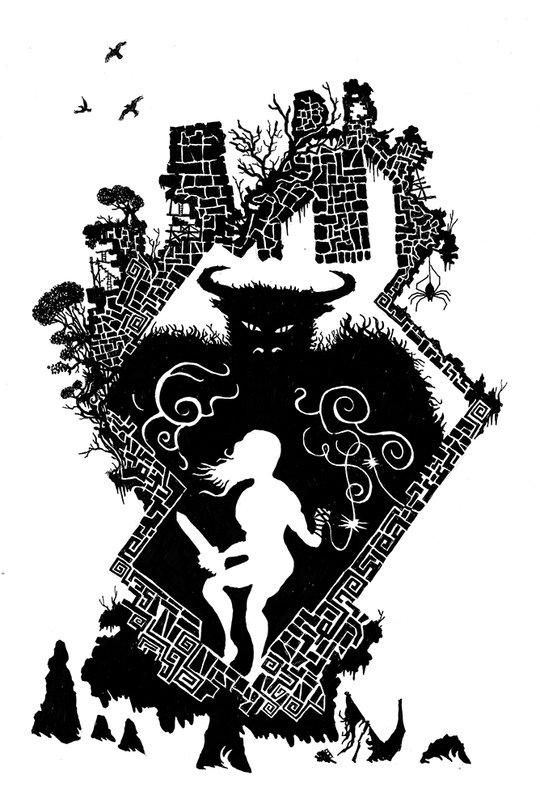 Silhouettes also offer a lot of opportunity for more abstract elements and symbolism, so I was able to render this drawing as a combination of Theseus confronting the Minotaur, and Minos’ island labyrinth.